384 pages | 55 B/W Illus. In the quest to remove supply channel costs, streamline channel communications, and link customers to the value-added resources found along the supply chain continuum, Supply Chain Management (SCM) has emerged as a tactical operations tool. 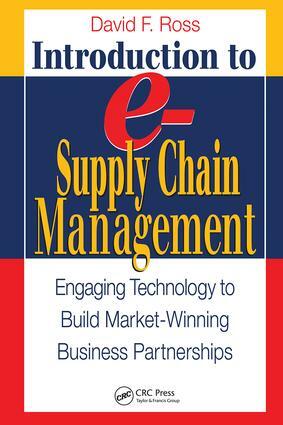 The first book to completely define the architecture of the merger of SCM and the Internet, Introduction to e-Supply Chain Management: Engaging Technology to Build Market-Winning Business Partnerships shows you how to exploit this merger and gain an unbeatable competitive advantage. The tightening of the economy and heavier restrictions and security measures placed on channel flows have rendered access to real-time, accurate supply chain information more critical than ever. Connectivity, messaging, and collaboration have become today's foremost buzzwords, as companies compete for survival in an environment where cycle times and permissable margins of error continue to shrink. Introduction to e-Supply Chain Management explores the concepts, techniques, and vocabulary of the convergence of SCM and the Internet so that companies can move beyond merely surviving and thrive in today's competitive marketplace. "This is a timely book, coming as it does after the bursting of the dotcom bubble that deflected much of the massive investment needed to in both international and company infrastructure to make e-SCM possible." Rise of the "New Economy"